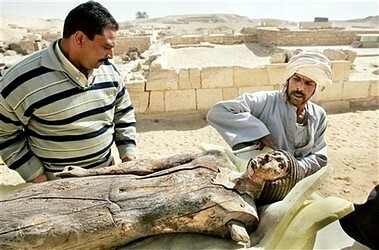 Una rara estatua doble de madera de un antiguo escriba egipcio y su mujer ha sido encontrada en su tumba al sur de El Cairo, dijo el lunes el jefe de los arqueólogos del país. 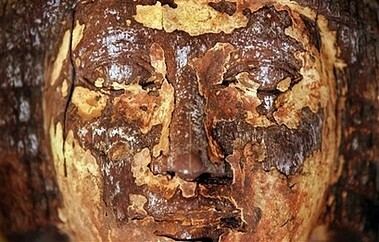 La estatua doble, que data de cerca del 2.300 a.C., estaba entre un total de cinco imágenes de madera halladas en el sepulcro en Sakkara, la necrópolis de la ciudad de Memphis, dijo Zahi Hawass presidente del Consejo Supremo de Antigüedades. El escriba era Ka-Hay, que registraba lo divino, y su esposa, Spri-Ankh. Vivieron al final de la quinta dinastía o al principio de la sexta y fueron enterrados en la parte de la necrópolis asociada al faraón Teti, señaló en un comunicado. "Es una estatua única (...) normalmente las estatuas dobles están echas de piedra caliza y raramente talladas en madera", agregó Hawass. La pieza fue descubierta por un equipo egipcio-australiano. La tumba es una estructura de ladrillos de barro con el estilo clásico de plataforma y tiene una falsa puerta de madera y dos mesas de ofrendas, añadió. Las puertas falsas eran algo habitual en los sepulcros del periodo. El equipo arqueológico, liderado ahora por Naguib Kanawati de la Universidad Macquarie de Sydney, ha estado trabajando en Sakkara desde el principio de la década de 1970. 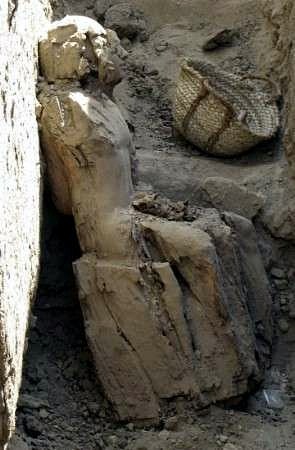 A rare double wooden statue of an ancient Egyptian scribe and his wife has been found in their tomb south of Cairo, Egypts chief archaeologist said on Monday. 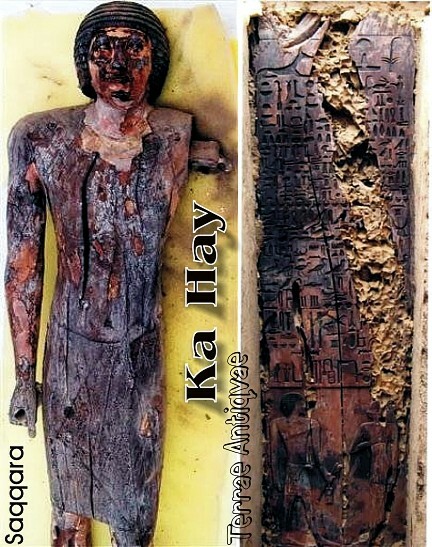 The official was Ka-Hay, who kept divine records, and his wife, Spri-Ankh. 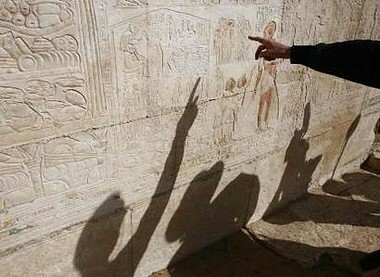 They lived late in the 5th dynasty or early in the 6th and were buried in the part of the necropolis associated with the pharaoh Teti, he said in a statement. "It is a unique statue... 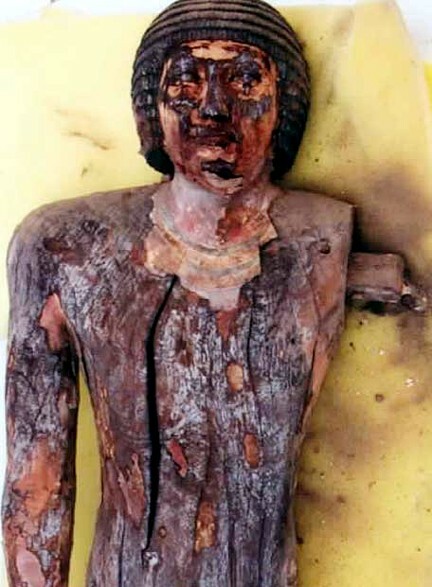 In general double seated statues are made of limestone and are rarely carved in wood," he said. 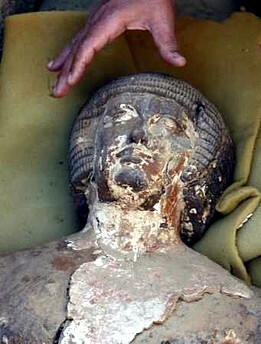 The find was uncovered by an Egyptian-Australian team. The tomb itself is a mud-brick structure of the classic platform style and contains a fine false door in wood and two tables for offerings, he added. False doors are a regular feature of the tombs of the period. The archaeological team, now led by Naguib Kanawati of Macquarie University in Sydney, has been working at Sakkara since the early 1970s. 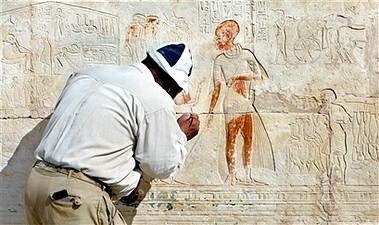 SAQQARA, Egypt - Archeologists unveiled Tuesday the tombs of a Pharaonic butler and scribe that had been buried in the sand for more than 3,000 years. The tombs, along with the painted coffins of a priest and his girlfriend, were discovered early this year at Saqqara near the famous Step Pyramid of King Djoser  the oldest of Egypts more than 90 pyramids. 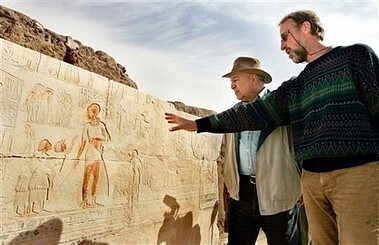 "The sands of Saqqara reveal lots of secrets," said Egypts antiquities chief, Zahi Hawass, as he showed reporters around a 4,000-year-old tomb of mud bricks that belonged to a scribe of divine records, Ka-Hay, and his wife. "It doesnt look great because it was built from mud brick and not built of limestone, but I really believe that this tomb is very important," said Hawass, who was wearing his Indiana Jones-style hat. "This type of tomb could enrich our knowledge about the people who actually surrounded the kings of Saqqara, especially the people who lived 4,200 years ago." The tomb featured a dark wooden door, which ancient Egyptians believed that the souls of the dead would use to leave their tomb. 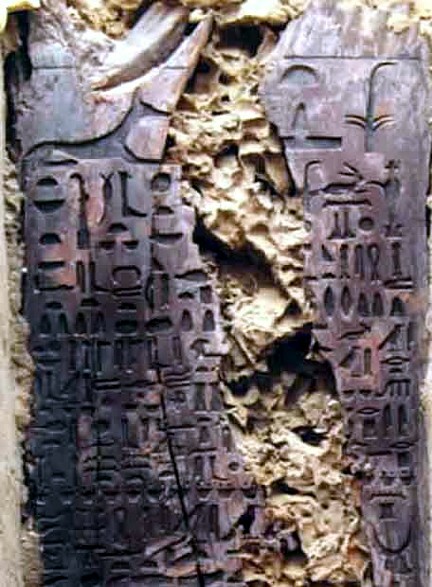 The door bore engravings in hieroglyphic text and pictures of the scribe and his wife. 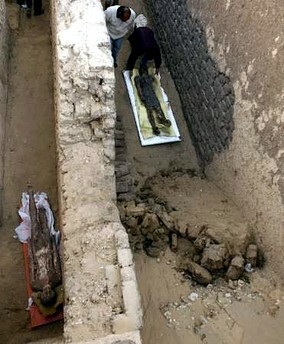 South of the Step Pyramid, archeologists unveiled a second tomb, which belonged to a butler who died 3,350 years ago. Carved out of limestone, the tomb contained murals that showed scenes of people performing rituals and monkeys eating fruit. The blue and orange colors of the paint were surprisingly well preserved. "This is a very, very lively scene," said Maarten Raven, the excavations director and a curator at the National Museum of Antiquities in Leiden, Netherlands. Raven said he believed other tombs from the New Kingdom, similar to the one unveiled Tuesday, had yet to be uncovered in Saqqara, which is famous for Old Kingdom antiquities. 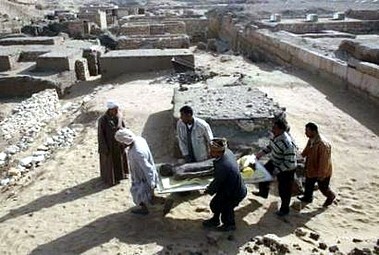 Many of the New Kingdom tombs, which date back from 1570 B.C. 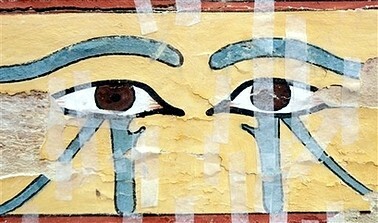 to 1070 B.C., can be found in the southern Egyptian city of Luxor. 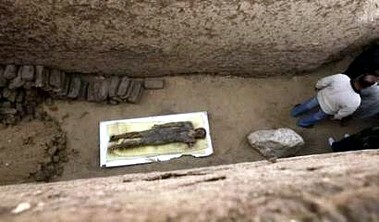 Hawass also unveiled two wooden coffins, 4,000 years old, that were found south of the Step Pyramid. 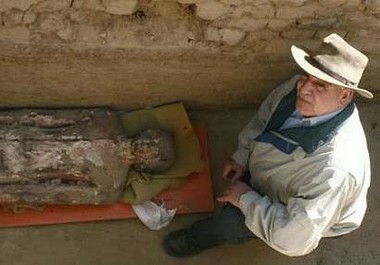 The coffins, painted light orange with blue hieroglyphics, contained human-shaped coffins known as anthropoids, in which lay the mummies of a priest and his girlfriend, Hawass said. 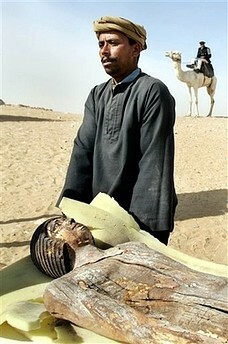 The ancient Egyptians believed anthropoids acted as a substitute body for the dead. 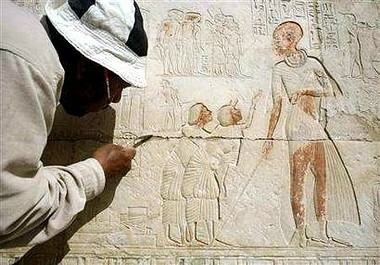 Although archaeologists have been exploring Egypt intensively for more than 150 years, Hawass believes only 30 percent of what lies under the sands at Saqqara has been uncovered. Saqqara, about 12 miles south of Cairo, hosts a collection of temples, tombs and funerary complexes. Its Step Pyramid is the forerunner of the more sophisticated pyramids in Giza, which are believed to have been built about a century later.